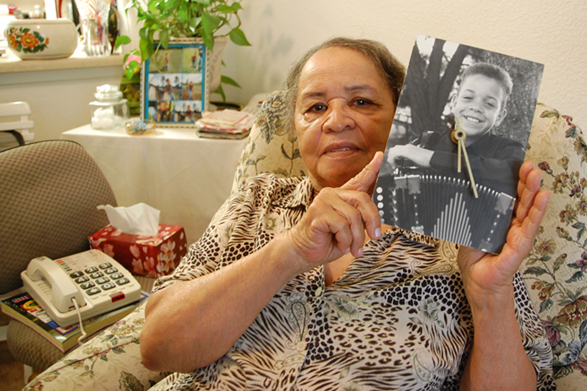 Lena Pitre holding a picture of her grandson Andre Thierry. Photo by Barry Yeoman. Known universally as Mama Lena, 82-year-old Lena Pitre is considered the matriarch of Northern California’s Creole community. Raised in Soileau, Louisiana, Pitre recalls a childhood of poverty and hard work, but nonetheless one filled with music, dance, and “good times.” In the 1960s, she moved to the Bay Area—her husband Houston worked in construction, and there were more job opportunities out West. Shortly after their arrival, the couple began organizing the dances at St. Mark’s Catholic Church in Richmond. On the days surrounding the dances, they hosted jam sessions in their back yard featuring visiting performers from Louisiana. Pitre is the grandmother of two young zydeco musicians: washboard player Jason Thierry and accordion player Andre Thierry. In this clip, she recounts the hardships of life in the country—and describes the rules that young men followed at the zydeco dances of her childhood.